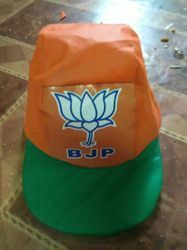 Prominent & Leading Manufacturer from Noida, we offer election caps. As a quality-oriented organization, we are focused to provide our clients excellent quality Election Caps. The offered caps are designed by our deft professionals with utmost care and perfection by making use of quality assured raw material and sophisticated technology. In order to make sure the quality of these caps, our experts test the entire range on various parameters. Apart from this, we provide the entire range in different specifications to meet the varied needs of clients.